Prostanthera ovalifolia, Oval-leaved Mint Bush is a variable shrub that may reach a height of five metres. The specimens in our garden only reach two metres. Judicious pruning will limit the height and prevent the plant becoming straggly. Leaves range in size from 5 mm to 50 mm in length. They are moderately crowded, mid green to dark green and strongly aromatic. 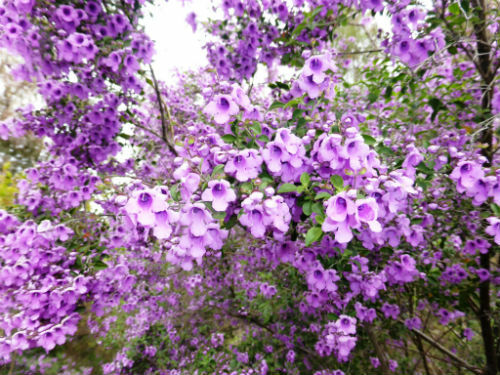 Flowers are one cm long, mauve, purple or bluish-purple. There is also a white-flowered form and another form with variegated foliage. Flowering covers the spring period and at this time blooms are both conspicious and profuse. The Oval-leaved Mint Bush is a useful screening plant. Also try planting beside paths so the foliage aroma is released as you brush past. P. ovalifolia is probably the most widely cultivated mint bush. During dry periods plants have a tendency to wilt. Mulching and watering will bring plants bouncing back. P. ovalifolia is a native of NSW and Queensland.